Each of the ladies in Black Panther are superheroes in their own right. Though the film’s central lead may be a man, T’Challa (played by Chadwick Boseman), it’s clear even in the trailers promoting the film that the women of Wakanda play a prominent role as warriors, counselors and protectors. At various points, we get treated to images of strong women of color giving T’Challa advice about how to be a ruler and protecting him at all costs. It’s a depiction we are rarely treated to in cinema, and it’s an even rarer treat in the world of superhero movies. 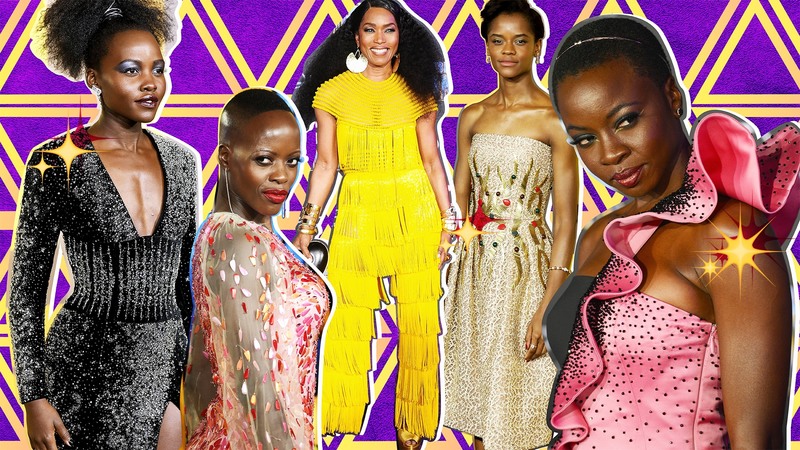 Actors Angela Bassett, Letitia Wright, Danai Gurira, Lupita Nyong’o and Florence Kasumba all bring to life characters who are integral to the storyline. Bassett plays Ramonda, the queen mother of Wakanda. Wright plays Shuri, T’Challa’s half-sister and the head of Wakanda Design Group and — bonus! — she is reportedly even smarter and more tech-savvy than Tony Stark. Gurira plays Okoye, a Wakandan general in the Dora Milaje, an elite unit charged with protecting T’Challa. She happens to be one of T’Challa’s most trusted advisors. Nyong’o plays Nakia, an international spy and T’Challa’s love interest. Finally, Kasumba plays Ayo, another member of the Dora Milaje who we first saw in Captain America: Civil War. But the women in these roles aren’t just playing strong, interesting and diverse characters. They are all of those things to be sure, but in real life, they’re just as badass. To prove this final point, let’s take a look at some noteworthy facts about each of the women of Black Panther. Nyong’o speaks her native Luo language, English, Swahili and Spanish. She graduated with her master’s in fine arts from Yale. She was also awarded the Herschel Williams Prize, which is given to acting students with outstanding ability. Nyong’o was born in Mexico City, Mexico, but was raised in Kenya. Her family moved when she was less than a year old. Nyong’o definitely started her acting career on a high note. She won the Oscar for Best Supporting Actress for her debut role in 12 Years A Slave. Nyong’o wrote, produced and directed the 2009 documentary In My Genes. She also directed the music video “The Little Things You Do” by Wahu featuring Bobi Wine. The video earned her a nomination for Best Video Award at the MTV Africa Music Awards 2009. When she was 20 and a struggling actor, Wright dealt with depression. “I was in the dark going through so many bad things, when the world didn’t know about Shuri and Letitia and whatever is happening now,” she said. She credits God with getting her through. Wright was born in Guyana but moved with her family to London, where her mother worked as a teacher, when she was just 7. More: The Avengers Quote Quiz: Which Superhero Said It? Bassett received her master’s from Yale’s School of Drama, where she also met her now-husband and fellow actor Courtney B. Vance. Bassett turned down the female lead in Monster’s Ball due to the film’s sexual explicitness. Halle Berry was then cast in the role and won an Oscar for her performance. Urban Dictionary defines an “Angela Bassett Moment” as “A moment in which a man/woman gets incredibly angry and pissed at his/her lover (usually for infidelity) and goes batshit crazy. Usually involves destroying all of their partner’s personal belongings they can find. May involve a bonfire.” It was inspired by her movie Waiting to Exhale. Bassett worked with trainer Corey Calliet doing mostly 30-second interval training for up to an hour at a time. In addition to her role in Black Panther, Gurira plays the sword-wielding, zombie-killing Michonne on AMC’s The Walking Dead. What is it with the women of Black Panther and languages? They are crushing that game. Gurira speaks Shona, English, Xhosa and French. Gurira authored the Broadway play Eclipsed, which had an all-female cast, writer and director. The play takes place in 2003 and tells the story of five Liberian women and their tale of survival near the end of the Second Liberian Civil War. She was born in Uganda but moved to Germany when she was younger. As such, she speaks German, English and Dutch! She also makes an appearance in 2017’s Wonder Woman as Amazonian senator Acantha. In 2016, Kasumba was nominated for the Black Entertainment Film Fashion Television & Arts Award for International Rising Star along with Lupita Nyong’o, John Boyega and Lisa Awuku. Are you ready for Black Panther when it hits theaters this Friday, Feb. 16? Because we totally are.